This is one of the rarest, hardest, most expensive Tamagotchis to obtain. 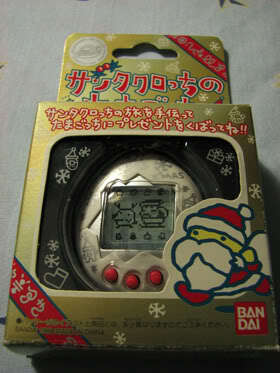 It is a special edition Christmas Tamagotchi with Santa Clause as the main character! I was fortunate to get this one for cheaper than usual (won't say how much I paid ;). This tamagotchi functions a bit differently than the regular pets. The goal of the game is not to raise Santa, but simply to get him to deliver presents on time! 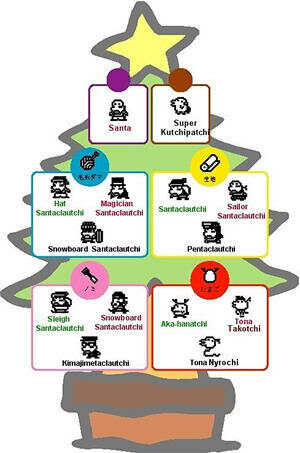 With each object Santa obtains, he can craft a new disguise to sneak into sleeping Tamagotchi's houses with. It's fun to try to get all his costumes. After 12 days (Twelve Days of Christmas!) the game ends. If Santa has acheived his goal of delivering the presents on time you win! He also gets a reindeer and a sleigh. It's so cute! This is by far one of my favorite tamas. Not only is it super pretty, the characters are some of cutest I've seen and he's super easy to take care of. When Santa turns his back on you it's because he feels unappreciated! Call Pochitchi to bring him back. When Santa reads a letter from the kids he feels better. When he goes to sleep at night, he resides in a little house with smoke coming out of the chimney. I love it! I got my Santagotchi ata bargain. Won't say how much, but they now run for $170-230ish. If you're lucky you may find one for $150. I see a few of them every now and again, so they definitely show up once in awhile if you wish to get one. Just check ebay once a month or so and you're bound to find one, especially around Christmas.